Michael Thomasson's massive collection of 10,607 games has broken a world record. Some people take their videogame hobby more seriously than others. For instance, some buy the latest console and just pick up game or two here and there when they see something they like. Others meanwhile, try to buy every console ever made and all the games along with them. 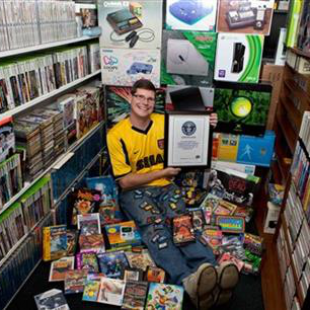 Standing on the peak of that category would be Michael Thomasson who was just recently crowned the king of game collection in the Guinness World Records 2014 Gamer's Edition. How many games, you might ask, earns you a world record? In Thomasson's case the count is 10,607, alongside a bevy of consoles popular, rare and obscure. "I have games on cartridge, laser disc. I have VHS-based games, cassette-based games," he said. He built his collection over the course of years, on average buying about two games a day while also sticking to a strict $3000 annual budget. He currently estimates the entire collection to be worth somewhere between $700-800,000. Thomasson, the father of a 5-year old girl, supports his hobby with a job as a game designer and teacher at Canisius College in Buffalo. Despite the tremendous size of his collection however, his various responsibilities keep him from playing games on a regular basis. "I probably get three hours of playing in a week," he said. "If I'm lucky." Thomasson's 10,607 exceeds the previous record, held Richard Lecce, by about 2,000 games. While Lecce says that his own collection has grown since he claimed the record in 2010, he he has no intention of challenging Thomasson.